Yesterday celebrated National Ice Cream Day, but it's never too late to worship of the creamy goodness that is ice cream. Created by the Persians and brought to the US by way of Quaker colonists, ice cream has transformed into one of world's most beloved desserts and way to keep cool. So, we thought you'd want to know where to find the best in town! These Ice Cream sandwiches created by Hannah Pollack and Xavier Meers are no ordinary creamy goodness. With flavors like Fat Elvis and Lavender Earl Grey, as well as many collaborations with local breweries, Nightingale coats your inside with flavorful goodness! Pastry Chef and Whisk owner, Morgan Botwinick just opened this very cute shop on Strawberry Street. Ice cream flights, sundaes, and make any choice a macaroon sandwich, you'll enjoy a scoop of happiness here. Looking to stay cool and hip in the city? 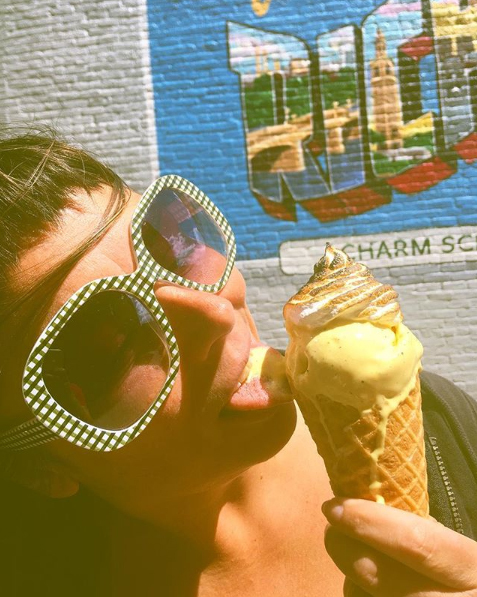 Charm School is your stop for floats and delicious ice cream. A great place for people watching. With vegan and classic flavors, this cute little shop in the city is a nice break from the art galleries of Broad Street. Still one of our favorites and a Carytown must, Bev's boasts an always classically good scoop. A great place to treat yourself after a movie at The Byrd Theater or getting your nails done at Fusion. Still one of RVA's favorites and with an addition in Scott's Addiction, you cannot go wrong with the 85 plus flavors in constant rotation. Best place to get ice cream pies and cakes for events and some of the best flavors to choose from like, Blanchard's Dark is Dark, Birthday Cake and a plethora of seasonal choices. Take a break from your brewery tour or stop by after a Squirrel's game, Gelati Celesti is the tops!